Have you begun to notice visible signs of aging and don’t know what to do about it? You struggle to prevent wrinkles and volume loss with creams and serums, but they aren’t giving you the results you want. You’re not alone with the problem, and you may be like many others who don’t want to go under the knife to reverse time. Luckily, at O’Neil Skin & Lipo Medical Center, we perform facial rejuvenation without surgery. 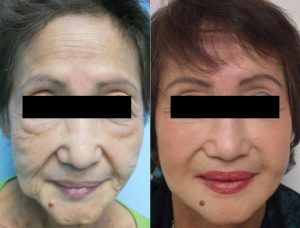 Dr. O’Neil developed his unique Liquid Facelift process to provide his patients with the dramatic anti-aging results they desire, without invasive surgery. Hyaluronic acid, which occurs naturally in the body, is injected into both the surface layers and deeper tissues of the face. This deep penetration allows the solution to work on a foundational level, providing you with more dramatic and longer-lasting results. What’s Treated With the Liquid Facelift? We use twilight sedation, which ensures a painless and comfortable procedure but has fewer negative side effects than general anesthesia. A small cannula is used for injection, which doesn’t require an incision and leaves no visible scarring. Our special injection technique minimizes postoperative bruising so you look better faster. We inject the hyaluronic acid solution evenly throughout the face to avoid clumping and other surface irregularities. The Liquid Facelift is just one of many non-surgical facial rejuvenation systems offered at O’Neil Skin & Lipo Medical Center. You should always schedule a consultation to get your skin needs evaluated. We offer treatments that help address facial laxity and pigmentation issues, in addition to wrinkles and poor skin tone. Finding the right treatment for you is important to achieve amazingly beautiful results.